This living concept that stretches beyond usual expectations is located in Fujian, China. 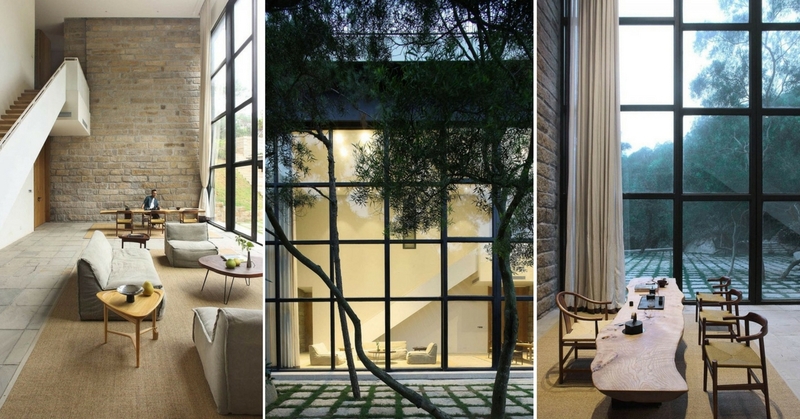 Natural materials like cane and wood, along with subdued hues completely compose the house, extending this theme even to its exteriors from the foliage courtyard and pavement of matrix squares to the towering stone-walled living room that looks over it all. Time slows down and seems to stand still in this house, and one becomes completely enveloped in tranquillity. A staircase of simple wooden steps minds the stone walls of the living and dining areas below it, quietly welcoming the daily sunlight; facilitated by the handsomely spacious wall-to-ceiling windows. On the ground floor, a rectangle khaki rug laid over perfect stone tiles enhances the muted but attractive furniture and carefully chosen textiles. The iconic stone wall extends two stories, blending harmoniously with the collection of diverse wood textures observable throughout the abode. Unassuming décor characterises this house, with unclear lines of where the outdoors and indoors end and begin, exemplified in the seemingly effortless and rustic table concepts. Minimalistic in every way, with familiar and similar patterns used throughout the house, demonstrated in the design of the pavement stones and windows.